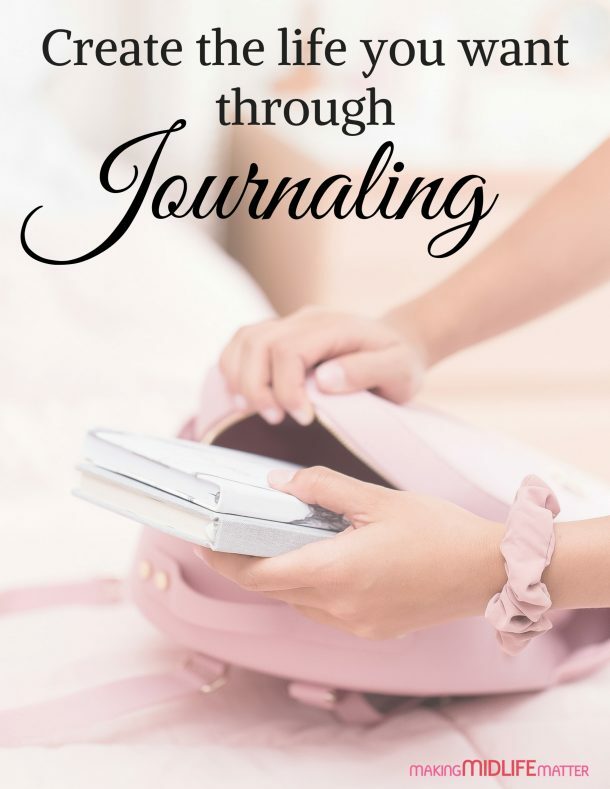 by Elena Peters | Clean, Home, This post may contain affiliate links. Please see Disclosure Policy. But in this same world of puppy-dog eyes, slobbery kisses, and furry snuggles, there’s also a whole lot of stinky mishaps, wet-dog aromas, and endless tufts of fur. 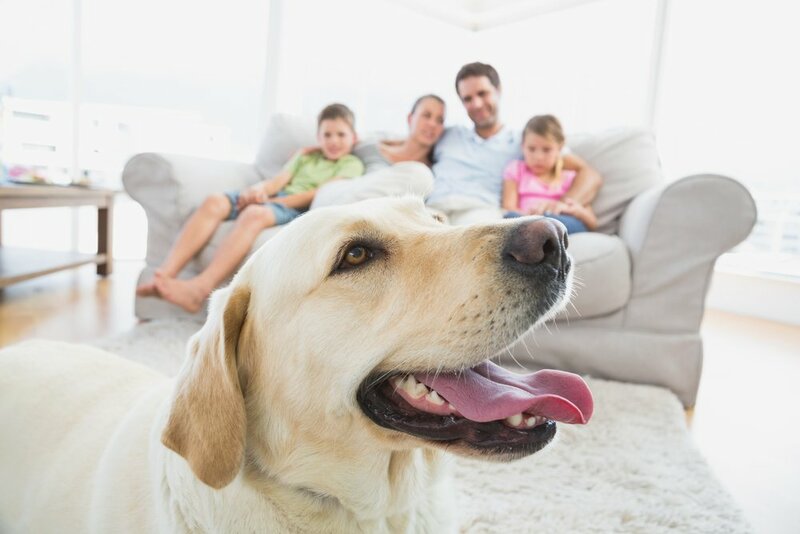 Fortunately, we have the best 6 tips to get rid of dog smell in the house, so you’ll no longer need to hand out military-grade gas masks at every family gathering! Does the overwhelming aroma of urine hit you in the face the second you walk through the front door? Whether it’s Princess’s delicate bladder issue (which we don’t discuss when she’s in the room because she’s very sensitive about the subject) or Brutus’s way of letting you know he doesn’t like it when you go to work, it can be a total pain to eliminate lingering urine smell. After several sessions of scrubbing carpets and spraying fabrics, you’ve decided that the gods of Fabreze are obviously giving you the silent treatment. 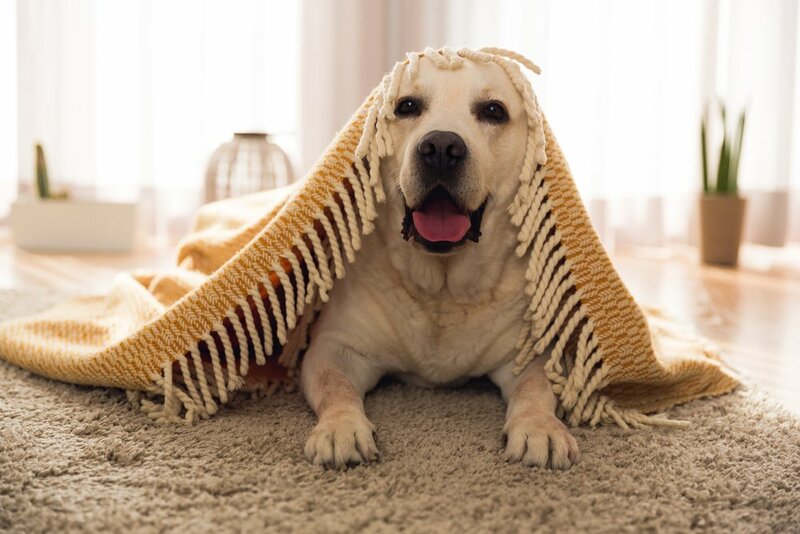 Luckily, there’s a non-toxic, all-natural solution to cleaning stinky carpets that are most likely hiding away in your pantry: baking soda and white vinegar. Step 1: Blot the area with paper towels until all the liquid is absorbed. Step 2: Mix 50% vinegar with 50% water in a spray bottle, and soak the area in question with the solution (if the smell is particularly odiferous, go with 100% vinegar). Step 3: Scrub, scrub, scrub the area with a clean, soft scrub brush. Step 4: Now, pour a generous amount of baking soda over the spot, and let it sit for 12-24 hours until it is dry. Step 5: Once dry, vacuum the carpeting (and enjoy the fact that it doesn’t smell like pee anymore). Pet hair everywhere? Don’t remember if that Angora throw-pillow from Chile was supposed to be that hairy? Forgot what it’s like to wear black clothing without looking like you wrestled with a Leonberger? To remove fur, hair, and fluffy stuff from… well… pretty much anything, lint rollers are a real godsend. 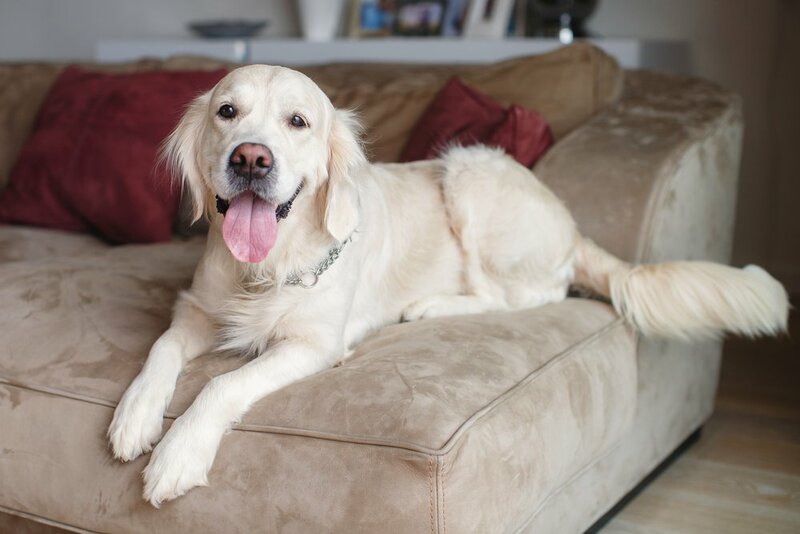 When you take the time to get rid of dog hair from your surroundings, you’re effectively reducing the odor level. often come with extra attachments that deep-clean to extract even the tinniest coat hair. 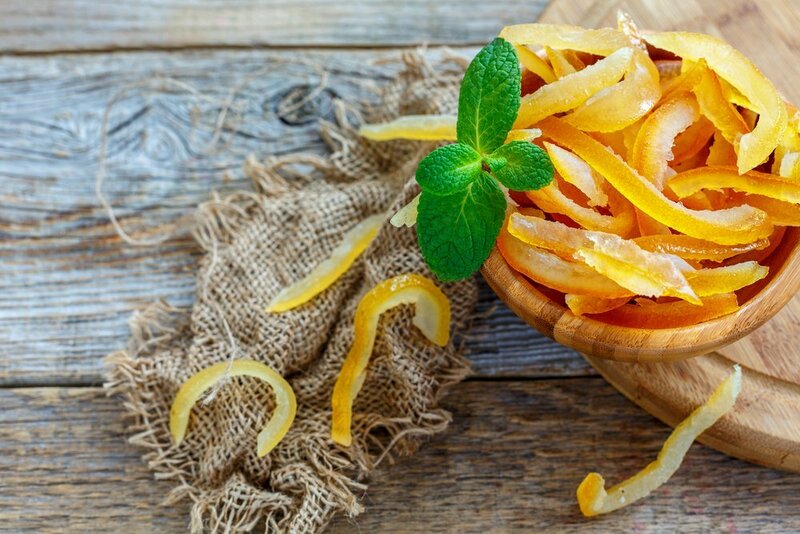 Go all-natural with citrus peels by placing them all over your home. Hide small, opened boxes of baking soda throughout the house, ideally in every room to absorb the unwelcome scents. , and make it a point to change the filters regularly. Air out your home 2-3 times a week by opening your windows.
. Toss them in the wash frequently to keep the smells at bay. While you can indeed purchase a myriad of lovely designs in-store or online, you can also keep things more affordable by using whatever spare sheets, blankets, or throws you have on hand. As long as they’re easy-to-wash and quick-to-remove, you’re sure to have fewer odors in your home. #5) The Cleaner The Toys, The Better The Air Quality! 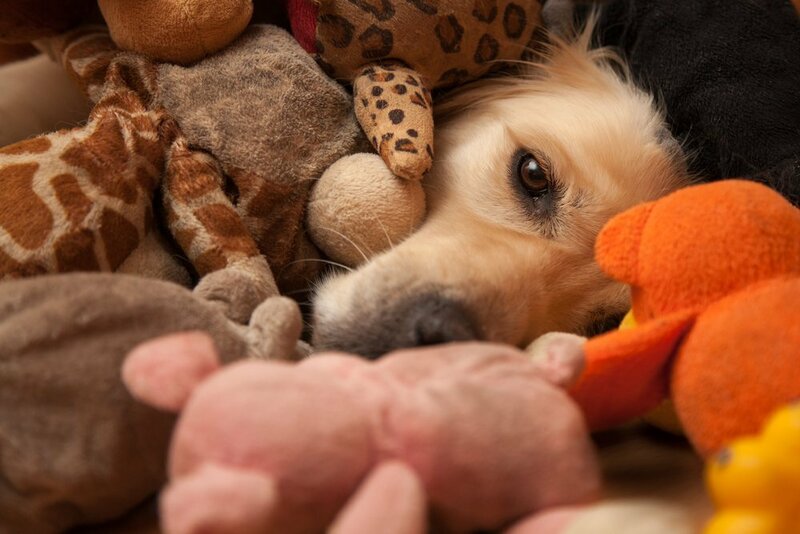 Does your canine companion love to chew on their favorite stuffed toy? Is your Retriever always retrieving his prized tug-rope… with his ever-drooling mouth? Then, perhaps it’s time to introduce their toys to Mr. Washing Machine. And that annoying, squeaky, rubber chicken you’ve been fantasizing about shipping to China, it can take a turn in Mrs. Dishwasher. No, this isn’t a joke, we’re quite serious! You see, all that gnawing, salivating, and licking ends up creating a scary amount of bacteria and germs. Remember the last time you entertained your pup by playing fetch with that loud, headache-inducing rubber chicken? Well, let’s just say, you basically handled the equivalent of a Petri dish full of germs. So, go on, give those toys a spa day, the wash cycle will clean and “de-funk-ify” those icky playthings. Both you and your dog will be all that much happier! Cleaning everything from baby bums to pooch paws, wet wipes are another must-have item for pet parents. 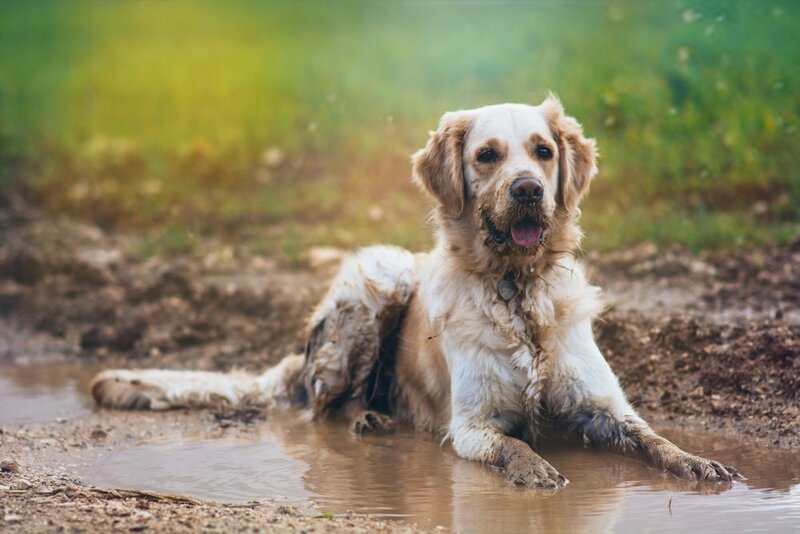 Once you arrive from your dog walks and other outdoor adventures, merely use a gentle baby wet wipe to clean off dirt, mud, and gunk before entering the house. When you add a few extra minutes to your routine by adding this quick step, you lessen the chances of tracking in things from the outside that may increase unwanted smells. This article was originally posted on Animallama. Lindsay Pereira is a pet-lov’in Montréal-based writer who’s a “mommy” to Maya, a sweet-tempered senior Labrador/Rottweiler and Muffy, a grumpy guinea pig with a serious attitude problem. She writes about pets at Animallama.